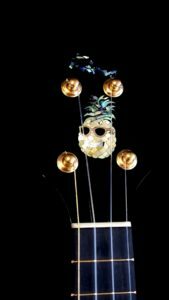 Yes, another Pineapple Ukulele. 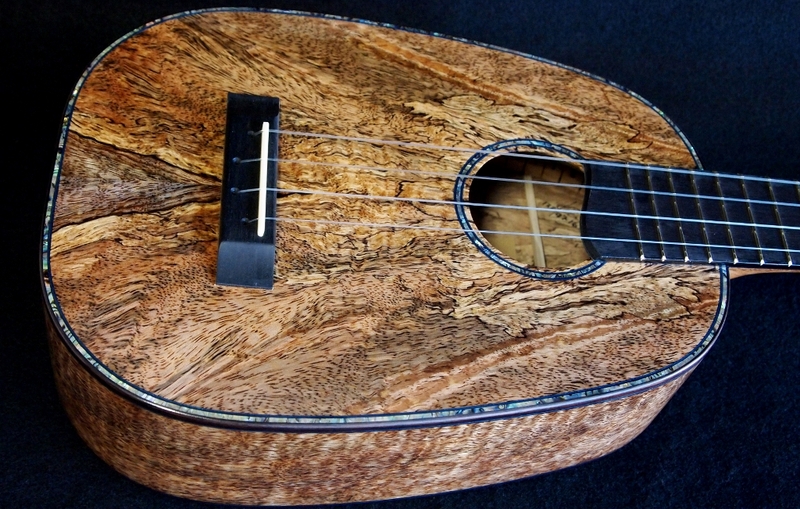 This Chocolate Heart Mango Pineapple Ukulele is now available at Hale Ukulele in San Diego. Another of Ric’s requests to provide more variety for his discerning customers. This is the first Tenor Pineapple out of my newly revised mold. The body is a bit shorter than the standard tenor ukulele but is the same width and depth. The old Tenor Pineapple shape with the standard tenor length, I felt, was just a bit to big. So, I changed the shape, not for any technical reason, but for aesthetics. 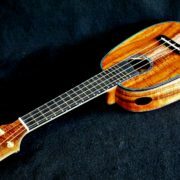 I didn’t measure the volume of the instrument but believe it to be close to the standard tenor ukulele since there is no waist. The sides are just a tinsy bit more curved than in my old mold and I find this to be just a touch more pleasing. This is a great example of Chocolate Heart Mango. 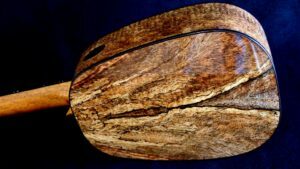 I never get tired of looking at this beautiful wood. 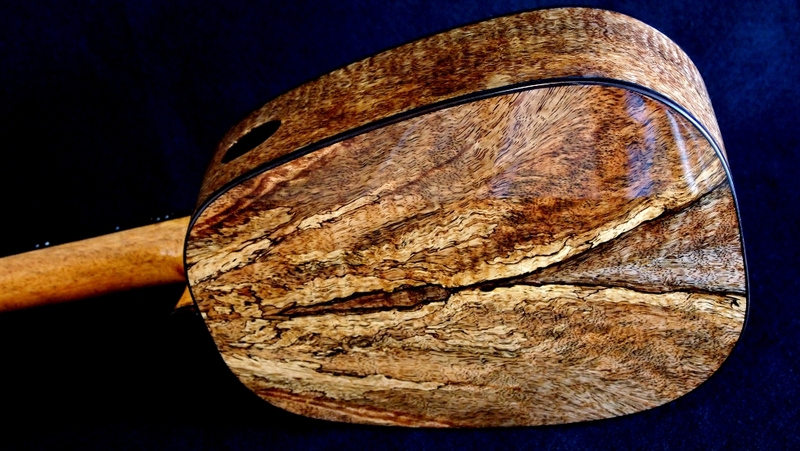 There is plenty of action here with spalting, curls, quilts, and all sorts color variations. All of this wood is from the same billet. This is a perfect example of why Chocolate Heart Mango is becoming increasingly hard to come by. 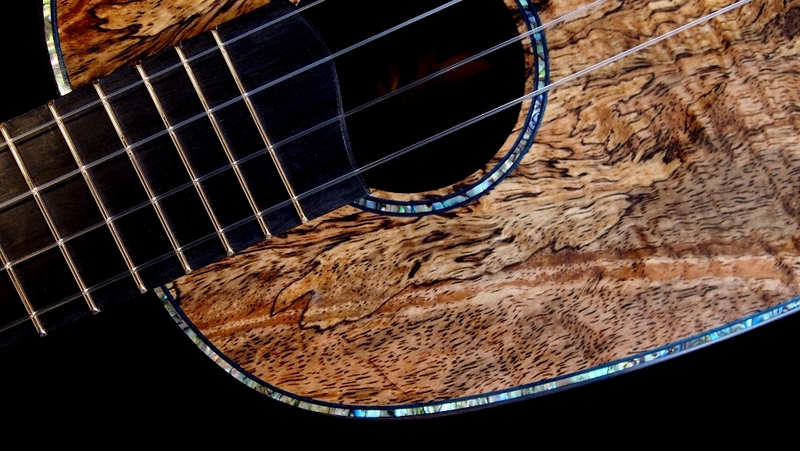 Per Ric’s request, I added Paua Abalone purfling with accents of dark blue stained maple. 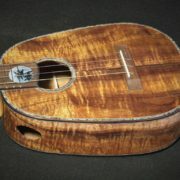 The binding is India Rosewood and the fret board and bridge are ebony species. 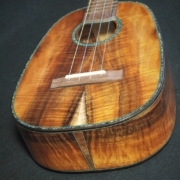 The accent wood is chocolate Koa. 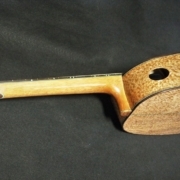 The neck is Honduran Mahogany with internal carbon fiber truss rod. 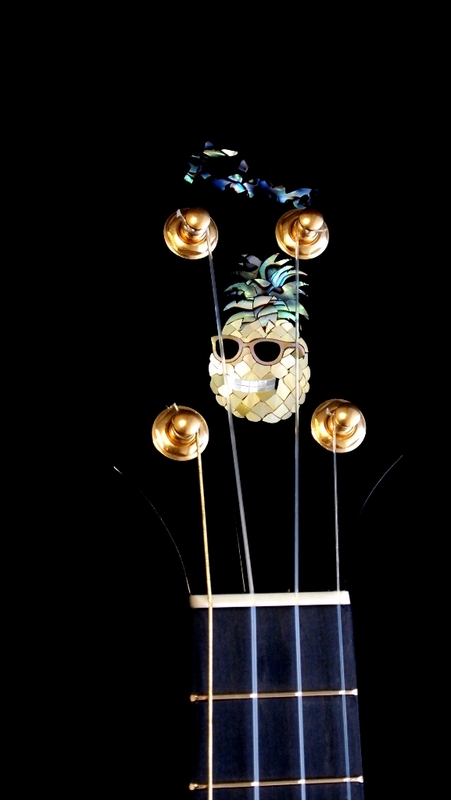 Like on the last pineapple ukulele I added the “Mr. 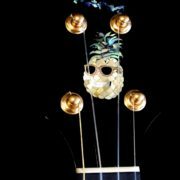 Cool” pineapple logo to the head stock with gold Gotoh planetary tuners. 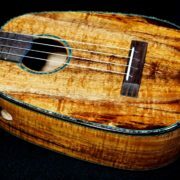 With a standard set of GHS flourocarbon low “G” strings, I find the tone and voice of this instrument to be very similar to a standard tenor built of the same wood. A Chocolate Heart Mango Pineapple Ukulele is pretty cool.